Imagine what you can achieve with the right grinding media in your bead mill. With FOX Zirconium Oxide Grinding Media, you can discover how simple and easy it is to keep your mills healthy and unleash the untapped potential in your bead milling process. FOX Zirconium Oxide Grinding Media is chemically inert and non-toxic. This ceramic media is non-magnetic, and is proven to increase flow rates and improve particle dispersion. There are many things that set this ceramic grinding media apart from other ceramic milling media. One reason they are so unique, is their microstructure. 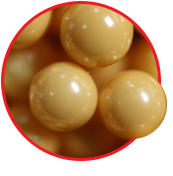 These ceramic balls are made from a combination of tough, high strength, Tetragonal Zirconia Polycrystal (TZP) materials. These tighter microstructures enhance wear resistance in the grinding media. They’re even denser, harder, tougher, and more wear resistant than FOX Zirconium Silicate grinding balls, and that’s saying a lot! With that kind of extreme wear resistance from your grinding beads, how much could you boost your production?